North America is one of the places with the best dental healthcare in the world. The society provides a great dental hygiene education, and dental services. Yes, it is more expensive than most other countries, but you get great services, and the system encourages regular checkups for most of the population. My dental health is in a relatively good state now, and the regular checkups at the dentist’s office, and the periodical dental cleaning, help with that. However, no matter what I did, with age, my gums were harder to maintain. Even though my oral hygiene was better than ever, no flossing skipping and no short routine for brushing, like I used to do in the past, things were not improving. Even though my dental hygienist was saying that my teeth and my gums were in great shape, I felt like things were not right. My teeth became more sensitive, my gums started to feel different. Particularly, the gums around the dental bridge, started to recede. I felt that there had to be something that could be done for my overall oral health, so I started my research. You are probably curious what were these products, here they are: bentonite clay, Peelu, (miswak fibers), activated charcoal, and oral probiotics. The first three products are different ways to reduce the bad mouth bacteria. Bentonite clay and Peelu can be used on a regular basis, as toothpaste replacement. I used both for extended periods of time, but I prefer Peelu, (I don’t have a logical reason for that). Activated charcoal is great to use for short periods of times, no more than 4-5 day, although I heard people who used it for more than that. The reason is because Activated charcoal might modify your oral microflora beyond the safe threshold. For cases with severe dental problems, and pathogenic preponderant microflora, this should not be the case. However, for severe cases, you should see a dentist, who will tackle the problem with a conventional gum disease treatment, and will have you under supervision. I also tried xylitol for a while, and I had some great results treating those throat infections, with lingering cough, nose and ear infections. However, I am not confident using xylitol on a regular basis. The reason for this is my test with brewing water kefir lemonade with xylitol, which convinced me that xylitol kills bad bacteria, but it kills a lot of the good bacteria as well, in the process. I think it’s good for people with an imbalanced oral microbiota, because it kills the pathogens. But after killing the pathogens you need to introduce probiotics in order to prevent bad bacteria and yeast to take over again. The more convincing fact against using xylitol long term is this study, which shows that it only takes 15 day for some oral bacterial strains to adapt and digest xylitol. When this happens, it starts to produce acids which will attack your teeth. I still use xylitol but only occasionally, and for short periods of time. Our oral microflora is very diverse, and it includes a lot of bacterial strains, some are good, some are bad, some are bad only if their number is too high. Some bacterial strains are better equipped to kill pathogens, and these specific strains are included in the oral probiotic supplements. Most of the strains are naturally occurring in our oral cavity, and we just need to help them reach the critical number where they can defend you. Some strains are only present in a small percentage of the population, and we can only get them by supplementing. One of the most active pathogens in our mouth is Streptococcus mutans and it is the most targeted microorganisms in oral health research. S. mutans and other bad bacteria are constantly producing a sticky coating, refered to as biofilm. The biofilm is meant to protect the S. Mutans colony, and it is harmful for our teeth and gums. As biofilm grows, it becomes what we know as dental plaque. Oral health probiotics are still actively researched, but there is much progress in the field, for more info check this article. The conventional treatment for periodontal disease is to use a strong antimicrobial solution and kill all microbes in your mouth. While this is a great solution, in many cases killing all bacteria in your mouth will allow pathogens to grow back faster, because now they don’t have any competition anymore. Your natural defense, the good bacteria, was eliminated in the process. Probably the most important part of my dental health recovery was the oral probiotic supplements. There are not too many dental health probiotics on the market, the main reason is because they are relatively new. But for me the oral probiotics had the most dramatic results. It only makes sense when you think what probiotics do. Here is a quick explanation of how oral health probiotics work. A healthy person has a balanced oral microflora with more good than bad bacteria. The good bacteria in mouth keep the pathogens in control, so there is a natural stability in this micro ecosystem. When this balance is tipped in favor of the pathogens, they start multiplying and changing the chemical balance in your mouth, creating disease. Some of the conditions associated with bad microbes’ overgrowth are tooth decay and gingivitis, which untreated can progress into periodontal disease. By externally introducing probiotics in our oral microbiota, we bring in an army of combatants to fight the bad bacteria. My favorite supplements for oral health are Prodental from HyperBiotics, Evora Pro from Oragenics, and Life Extension’s Advanced Oral Hygiene Mint. Hard to decide which one was better, so I am using all three products. I take a different probiotic every day, this way I am diversifying my oral microbiota. I haven’t tried Prodentis yet, and Pro-t-action. GUM’s Prodentis is easy to buy, and it seems like it is a great product, but I just didn’t need another pill on my long list of supplements. Pro-t-action seems to be only available in Europe. Prodental from Hyperbiotics is a supplement targeting more than teeth and gums health. This product contains the two oral health probiotics from BLIS Technologies the M18, targeting the teeth and gums health, and K12 for preventing throat and years infection. It also contains Lactobacillus reuteri, and Lactobacillus paracasei which are meant to gradually colonize the oral cavity. Prodental encapsulation is ensured by a patented method from Nutraceutix, called LiveBac, which ensures the viability of the live cells for longer time. Streptococcus salivarius K12 Sold under the name BLIS K12, S. salivarius K12. Streptococcus salivarius M18 salivarius M18 is one of the strains that are naturally found in our oral microbiota and was included in a few studies that proved its efficiency in reducing plaque, and improving gums’ health. Lactobacillus Reuteri Lactobacillus reuteri is another strain that was proven to reduce plaque formation, and improve overall gum health. Lactobacillus Paracasei is not only a major gut coloniser, but it is also a coloniser of our mouth. L. paracasei can adhere to mucosa easier than other microorganisms, hence colonise the mouth. Chelated Zinc, a form of Zinc that is bioavailable and is a powerful antioxidant. Advanced Oral Hygiene fromLife Extension contains, GanedenBC30, and K12. GanedenBC30 is a strain with double action, it is great for both dental and intestinal health. This strain has been reviewed in many studies and it has a demonstrated efficacy. The efficacy of the strain is not doubtable, and the fact that it benefits your gut as well is a bonus. K12 is one of the most efficient probiotics to protect you from throat, ear, and nose infections. If I were to critique this product, I would mention that I personally don't like the idea of sugar alcohols for dental health. Xylitol is OK for short term, and it works wonders for the first days, but do not use it on a long term basis. Since I rotate my probiotics, I only take this once every third day, so bacteria cannot really adapt to ferment the xylitol and mannitol in these lozenges. G-U-M PerioBalance contains Prodentis, a patented beneficial bacteria, (Lactobacillus reuteri Prodentis), and which is exclusively used in Sunstar G-U-M’s product in North America. 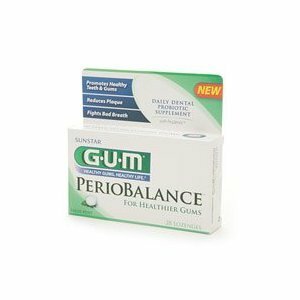 There are a lot of happy PerioBalance customers, and the general consensus is that it improves the gum’s health dramatically. Obviously, this doesn't replace a great daily cleaning routine, it only complements it. Prodentis is also very popular in Europe. 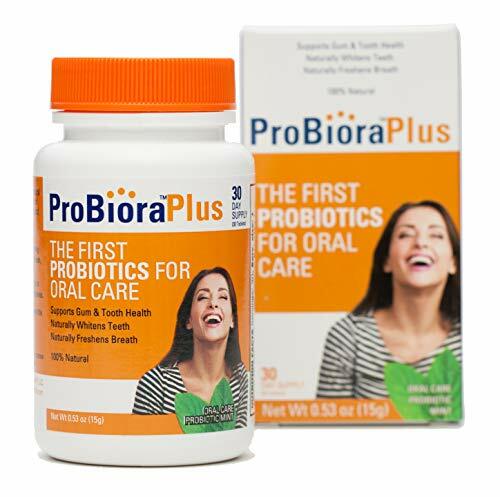 Probiora3 is a patented blend of probiotic strains for the oral health and is used in many probiotic supplements. My favorite Probiora3 supplement is Evora Pro. Evora Pro is made by Oragenics the inventor of Probiora. Evora Pro are small tablets that dissolve on your tongue and start populating your mouth microbiome. The strains in Probiora3 have the ability to colonize the mouth, if used long enough, however, because of our modern day diet, and lifestyle it is likely that you will need regular treatments. Evora Pro is my favorite because it doesn't contain sugar, or xylitol, or any other sugar alcohols. Many of the supplements containing Oragenics's blend contain these, and it is confirmed now, that bacteria can adapt to ferment sugar alcohols.